Considering the $3,751 federal tax credit on the C-Max Energi you might want to add up your own cost-of-ownership numbers. With its 21-mile all-electric range, the Energi could potentially save big on fuel cost for medium-distance commuters who can plug in at work and at home. Compared to the Toyota Prius, the 2014 Ford C-Max Hybrid and C-Max Energi provide more driving enjoyment as well as a more comfortable, stylish interior -- even if they don't quite measure up in real-world fuel efficiency. The 2014 Ford C-Max lineup consists of a pair of hybrid hatchbacks that offer the American automaker its first real challenge to the Toyota Prius. With lower gas mileage but significantly better handling and styling than the Prius, the C-Max Energi plug-in hybrid and the C-Max Hybrid are mostly carried over for the 2014 model year, with a major restatement on the fuel-economy front. In size and shape, the Ford C-Max pretty much splits the difference between the Prius Liftback and the more family-oriented Prius V wagon. At the same time, it's built on Ford Focus underpinnings, so it's essentially a tall-wagon version of that Ford subcompact. From the front, the C-Max gets a version of the large trapezoidal grille that's now used throughout much of the Ford lineup; alongside, accent lines and window angles add up to what is really a small minivan, or perhaps a tall and upright five-door hatchback. Inside, however, the C-Max builds on the interior of the Focus, with a rich and stylish dashboard and a number of high-end options; in all, it's a 'premium' look. With a 2.0-liter four-cylinder engine and electric motor system, the C-Max powertrain delivers 195 combined horsepower--54 hp more than that of the Toyota Prius powertrain. While the C-Max is several hundred pounds heavier, it does in practice still translate to a driving feel that's much perkier and less stressed than the Toyota. Ford had to revise its gas-mileage figures for the 2014 C-Max Hybrid down from 47 to 43 mpg early in the model year, after complaints from buyers that real-world fuel economy didn't come anywhere near the EPA rating. The Hybrid was then reduced a second time, in June 2014, and the C-Max Energi model had its efficiency ratings lowered as well. Current readings for the 2014 C-Max Hybrid are 40 mpg combined (42 mpg city, 37 mpg highway), which puts it lower than both the Prius Liftback and Prius V wagon models. The C-Max Energi was originally rated at 43 mpg combined (100 MPGe efficiency, 21 miles electric range), in June 2014 Ford lowered the ratings to 38 mpg combined (88 MPGe efficiency, 19 miles electric range) after discovering errors in lab-test measurements. That is still a longer electric range than plug-in hybrids from Toyota and Honda, although roughly half the range of the Chevy Volt range-extended electric car. In general, it's really tough to find fault in anything about how the 2014 Ford C-Max drives--especially if you use the Toyota Prius as a benchmark. 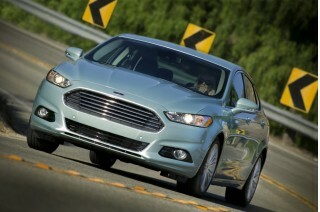 Steering is very precise and well-weighted—nearly as good as what you'll find in the Ford Focus. With a curb weight of nearly 3,700 in base form and around 3,900 pounds in plug-in Energi form, it's not quite as agile and lithe as the Focus, but not ponderous either. That C-Max Energi, the first-ever plug-in hybrid Ford has offered, offers a much more compelling alternative to the Prius Plug-In Hybrid. With a longer all-electric range of 19 miles (easy to do in real-world driving), it allows even medium-distance commuter the chance to go completely electric if they charge at home and at work. The key to the C-Max's very useful all-electric driving range is its far larger 7.6-kWh battery—versus 1.4-kWh in the standard C-Max hybrid. But that battery pack takes up some valuable cargo space, turning what would be a flat cargo floor into a compromised, multi-level affair that seems critically flawed when you flip forward the rear seatbacks. Otherwise, the C-Max Energi is pretty impressive for hauling four adults around. The back seats are a bit on the low side, leaving anyone adult-sized in a knees-up position; but there's plenty of legroom and headroom. Ride quality is firm but just agreeable enough, active noise cancellation and lots of sound-insulation measures help keep on-the-road refinement at its best. The C-Max still hasn't been rated by the Insurance Institute for Highway Safety (IIHS), but the federal government has given it a four-star overall rating (with four stars for frontal and five for side impact).A driver's knee bag is included in the usual range of safety equipment. All C-Max Hybrids come with standard 17-inch aluminum alloy wheels, a six-speaker AM/FM/CD/MP3 audio system with USB and auxiliary input jacks, an illuminated glove box, keyless entry, dual-zone automatic climate control, rear-seat heater vents, the Sync voice-controls system, and the SmartGauge digital display system with InfoGuide screens that let the driver configure information on the car's operation and energy consumption. Lots of option packages and a la carte options include items such as heated side mirrors, a power liftgate, MyFord Touch, and a Parking Technology package that will let the driver direct the C-Max to steer itself into a parking space. One final note: These impressions are based on time in 2013 models, and while the C-Max is mostly carry-over this year, Ford says that these models have new transmission gearing, essentially subbing in some taller ratios that might improve fuel efficiency. We'll update you on how this affects performance, if at all, as soon as we can get seat time in one of these 2014 models, which arrive later in the year. 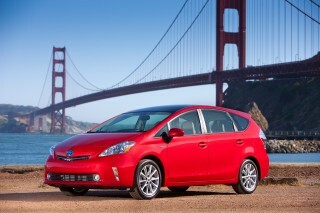 The 2014 Ford C-Max Hybrid isn't quite as distinctive as the iconic Toyota Prius, but it is stylish--especially inside. 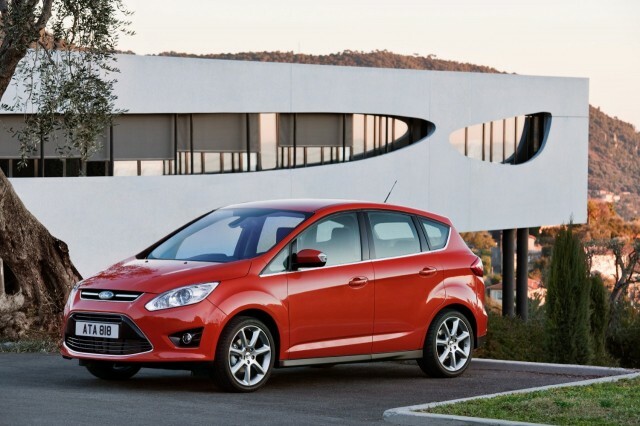 Is the 2014 Ford C-Max a tall wagon, a hatchback, or a van? We'll leave that up to your own eyes (and prejudices), but the reality is that the C-Max pretty much splits the difference between the Prius Liftback and the more family-oriented Prius V wagon if you go by body shape and exterior dimensions. The other fundamental truth is that it's built on Ford Focus underpinnings, so it's essentially a tall-wagon version of that Ford subcompact—and that's for better or worse, really. The exterior lines are nowhere near as racy as the Focus five-door hatchback, but this car serves a different audience: buyers who want the highest gas mileage and a car whose style says it's a hybrid. The up side—other than the way it drives, of course—is that it manages to preserves some of the Focus hatchback's down-to-business front end and its pert tail. The down side is that what's in between—to our eyes, at least—can appear a bit bulbous from some angles. In front, the C-Max gets a version of the large trapezoidal grille that's now used throughout much of the Ford lineup. Otherwise, the stylists have done their best to give it flowing lines, including highlighted wheel arches and a slight haunch over the rear wheel. We're not sure how successful Ford is in conveying the hybrid part of the message in the design, since the C-Max shape isn't nearly as distinctive and iconic as the ultra-aerodynamic Prius profile. Perhaps in time, observers will link the C-Max shape to "hybrid"--but we're not betting the farm on it. Inside, however, the C-Max builds on the interior of the Focus, with a rich and stylish dashboard (including colorful, configurable displays) and a number of high-end options; in all, it's a 'premium' look. With modern styling for the dash, soft-touch surfaces, and chrome accents it's undeniably more upscale than the hard-plastic 'flying buttress' interior of the Prius. The C-Max Hybrid is surprisingly perky and fun to drive when compared with other hybrid models. You can get the 2014 Ford C-Max with a charging plug or without one; but whichever way you get it, it's a full-fledged hybrid beneath it all, capable of going thousands of miles on a long-distance road trip or creeping along in slow-moving traffic in its quiet electric-only mode. With a 2.0-liter four-cylinder engine and electric motor system, the C-Max powertrain delivers 195 combined horsepower--54 hp more than that of the Toyota Prius powertrain. While the C-Max is several hundred pounds heavier, it translates to a driving feel that's much perkier and less stressed than the Toyota. 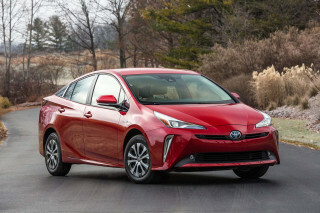 Just as in the Prius, it operates only with the electric motor system when you drive gently, at low speed, then starts the gasoline engine seamlessly and mixes the two power sources in most conditions—then recovering much of the energy from coasting and braking. In standard C-Max versions, tne electric motor can power the car alone, at speeds up to 62 mph (under certain light-load circumstances), or add torque to the engine output, and the other recharges the battery through regenerative braking and on engine overrun. The 1.4-kilowatt-hour lithium-ion battery pack is positioned under the load floor just behind the rear seat. 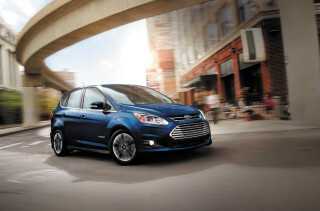 Where the standard C-Max and the plug-in C-Max Energi differ is that the Energi (Ford's first-ever plug-in hybrid) offers a realistic all-electric driving range of 21 miles—nearly double the Prius Plug-In's official range of 11 miles, and far more useful for an electric commute, with the benefits of a gasoline vehicle for weekend trips. The key to the C-Max's very useful all-electric driving range is its far larger 7.6-kWh battery—versus 1.4-kWh in the standard C-Max hybrid (it sacrifices some valuable cargo space, however). In general—and this is true for either of these models—it's really tough to find fault in anything about how the 2014 Ford C-Max drives--especially if you use the Prius as a benchmark. 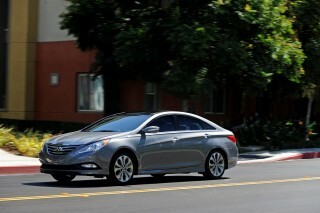 Steering is very precise and well-weighted—nearly as good as what you'll find in the Ford Focus. A hefty curb weight of nearly 3,700 in base form and around 3,900 pounds in plug-in Energi form means that it's not quite as agile and lithe as the Focus, but it's not ponderous. The only disappointment with the C-Max on the road was that it simply didn't have the tight, lithe feel of the Focus hatchback. It's 650 pounds heavier than a Focus five-door, and you can feel it on the road, where a relatively firm ride and suitably 'stout' suspension tuning means that road surface imperfections sometimes come directly through to passengers. One final note: These impressions are based on time in 2013 models, and while the C-Max is mostly carry-over this year, Ford says that these models have new transmission gearing, essentially subbing in some taller ratios that might improve fuel efficiency. We'll update you on how this affects performance, if at all, as soon as we can get seat time in a 2014 model. A very roomy, well-designed interior makes the most of the compact-car footprint in the Ford C-Max, while comfortable seats and straightforward controls add appeal. We find the entire 2014 Ford C-Max lineup to be very impressive for hauling four adults around. The back seats are a bit on the low side, leaving anyone adult-sized in a knees-up position; but there's plenty of legroom and headroom. Ride quality is firm but just agreeable enough, active noise cancellation and lots of sound-insulation measures help keep on-the-road refinement at its best. 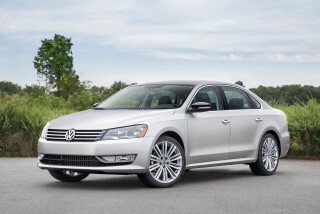 Front seats are very comfortable, and there's plenty of space front and rear even for adults over six feet tall. The base SE model seats are covered in a pale synthetic (recycled) upholstery, though you'll find the leather seating surfaces on the SEL far more plush. The rear seat in the C-Max is surprisingly comfortable—more so than equivalent accommodations in compact crossovers—and it folds and lowers with a pull on a single lever. Entry and exit are quite easy, too. The 2014 C-Max models definitely aren't luxury-car quiet, but their cabins are more refined than you might expect—and definitely more refined than those of the Prius family. Active Noise Cancellation is included, and it analyzes certain sounds in the cabin and cancels them out through the door speakers in real time. A good roster of safety systems and some respectable crash-test ratings make the C-Max at least a mid-pack protector. The C-Max still hasn't been rated by the Insurance Institute for Highway Safety (IIHS), but the federal government has given it the C-Max Energi model a four-star overall rating (with four stars for frontal and five for side impact). The C-Max hybrid models include front and side airbags for both front-seat occupants, side air-curtain bags for the first and second rows, and a driver's knee airbag. As befits a family vehicle, front shoulder belts have adjustable anchors to ensure they fit the widest range of occupants, from growing teens to full-sized parents. It has the usual array of electronic safety systems as well—including stability control, traction control, and anti-lock brakes with emergency brake assist. Even base versions of the Ford C-Max Hybrid feel better appointed than the utilitarian Prius -- and there's plenty of room for options. The 2014 Ford C-Max comes in two different trim levels—SE and SEL—and in standard C-Max Hybrid guise or in C-Max Energi plug-in-hybrid form. There are many chances to add options to the C-Max SE. 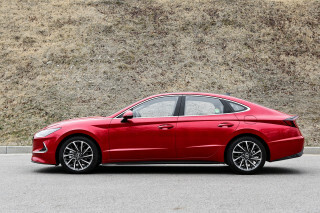 One of them is the Winter package (heated power mirrors with side indicators, and puddle lamps), or you could go with the Power Liftgate and Rear Park Assist package, or a package that bundles Sync Services, the MyFord Touch voice-control system, and Sirius XM satellite radio. Step up to the SEL, and you get Sync with MyFord Touch, a push-button start with proximity sensing, rain-sensing wipers, a reversing proximity warning system, heated and leather-trimmed front seats, and ambient LED interior lighting. Other possibilities include a Hands-Free Technology package that offers hands-free liftgate operation triggered by a kicking motion below the bumper, and a Parking Technology package that lets the driver direct the C-Max to steer itself into a parallel parking space. A la carte options include items such as heated side mirrors, a power liftgate, and MyFord Touch. The Ford C-Max Hybrid is EPA-rated at 47 mpg combined; and the Energi plug-in adds miles per gallon, in 'equivalent' theory. in the time that the Ford C-Max has been on the market, a significant portion of owners have complained that they weren't able to get anything close to the last year's EPA ratings of 47 mpg city, 47 highway. For the 2014 C-Max Hybrid, Ford was forced in August 2013 to lower its ratings to 43 mpg combined (45 mpg city, 40 mpg highway). The reduction came after Ford admitted that it had used the gas-mileage figures for the 2013 Fusion Hybrid sedan, which fell into the same weight class and used an identical powertrain. That practice was entirely legal under EPA rules, but after widespread buyer complaints and an investigation by the EPA into its real-world fuel economy, the company agreed to lower the ratings. Simultaneously, Ford has introduced gearing changes that should keep the four-cylinder engine at lower revs; a host of minor changes that should help aerodynamics; and a new engine oil for reduced friction—all changes that should help close that discrepancy between the official estimates and real-world results. UPDATE: In June 2014, Ford again lowered its ratings for the 2014 C-Max Hybrid--this time to 40 mpg combined (42 mpg city, 37 mpg highway) after discovering errors in lab-test measurements and calculations for aerodynamic drag. Ford agreed with the EPA to reduce the ratings a second time, and send a check for the increased gasoline costs to all owners of 2013 C-Max Hybrids, along with five other cars whose ratings were reduced at the same time. While 40 mpg is still higher than the majority of cars on the market, it is a lower rating than the larger (if less powerful) Toyota Prius V wagon. UPDATE: As for the C-Max Energi, efficiency ratings for the plug-in hybrid mdoel were lowered to 38 mpg combined (88 MPGe efficiency, 19 miles electric range) from 43 mpg combined (100 MPGe efficiency, 21 miles electric range). MPGe, or miles per gallon equivalent, is a measure of how far a car can travel electrically on the same amount of energy as is contained in 1 gallon of gasoline. In our road tests of the Energi model, we've seen gasoline-only mileage averages in the same range as the Hybrid model—in the upper 30s to around 40 mpg on gasoline alone. In both models, you get a special Eco Coach set of displays, oriented toward helping you understand the power flow of the powertrain and optimizing your use of charging, and of the hybrid system. Purchased my 2014 C-Max Energi one year used from a local dealer on the very day it was traded in by the local owner--had 16k miles on it. I had searched long and hard for a used one. In the six months I've... Purchased my 2014 C-Max Energi one year used from a local dealer on the very day it was traded in by the local owner--had 16k miles on it. I had searched long and hard for a used one. In the six months I've owned it, I'm in still in awe of the car. Most of my commuting is done within the 20 mile electric range. That range has also proved to extend as far as 25 miles on occasion. Right now, I've gone 2 1/2 months since my last fillup and still have 1/2 tank of gas. What people note as the big drawback, the size of the battery that takes up some of the cargo space hasn't been an issue for me for the most part, although it would be nice to have a fully-flat loading surface. But, I've loaded in 12 bags of mulch with room to spare, and find the rear netted storage can easily handle 5 or 6 grocery bags. Mileage on the open road ranges from 38mpg to 44.5mpg (on a 4 day road trip through the mountains of Colorado). I have NO issues with acceleration--it feels nearly as perky as the 6 cylinder Saturn VUE I owned for 10 years before this one. I'm not a electrical technician, but I can only say that all the bells and whistles this model came with have floored me, making me feel I'm driving a luxury car. I've figured out most of the Ford MyTouch system, which has been a huge boon. 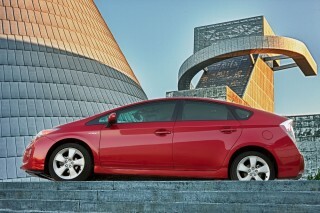 The 'training' systems have improved the way I drive, saving even more in fuel economy. Since I just plug into the 110 volt in my garage between use, I have no need for the 240 conversion--from a discharged battery, it's only 6 or 7 hours until a full charge is there. The local dealer I purchased this from has been outstanding in working with me, although I have had no maintenance issues at all in six months. The model I bought has the very handy Techno package with rear camera, upgraded sound, and the 'kick under the bumper to open' rear hatch.